It’s fur-reezing in the States right now. "Don't judge me, puny humans" -Anana the Lincoln Park Zoo bear. NOT EVEN FUR and layers of blubber are enough to protect from the bone-chilling cold which is hitting the US right now. As temperatures drop to as low as minus 30 degrees Celsius, there have been some unexpected problems. A polar bear at Chicago’s Lincoln Park Zoo found the temperatures too much to take, and has been brought indoors to her den. The zoo said Anana, the 14-year-old bear who lives on her own in the zoo and weighs more than 700lbs (50 stone/317kgs), had ventured out a couple of times but had spent most of the day indoors. “In Chicago we’re accustomed to weather extremes, with very cold winters and very hot summers, so the animals that are part of our zoo are chosen for their hardiness for winter or summer,” Sharon Dewar of Lincoln Park Zoo told PopSci.com. “But this is obviously an excessive extreme. So even animals that are pretty hard, and would be able to stay outside for normal winters – like the Mongolian camels and polar bear – even those animals we’re keeping indoors”. Polars bears would typically add a layer of blubber in late winter to protect them from extreme temperatures, but because Anana has spent her whole life in a zoo, she hasn’t added the blubber layer because she lives in a (usually) warmer climate. Large parts of America have been hit by frigid air and freezing temperatures due to a polar vortex – exceptionally cold air swirling down from the Arctic – which led to the coldest air in the country in two decades. A state of emergency was declared in some parts of the east coast, while schools were closed and emergency shelters were set up in other parts of the country to deal with the fall-out from the unusual weather. 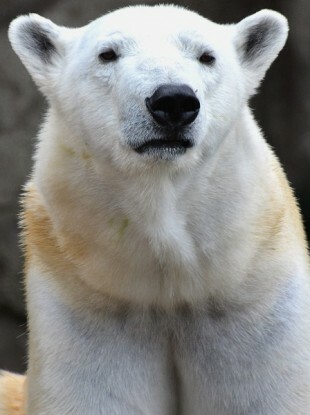 Email “It's so cold in the US that a polar bear was brought indoors at a zoo”. Feedback on “It's so cold in the US that a polar bear was brought indoors at a zoo”.